SHAREit is arguably the most popular file sharing app on the market today. The convenience it brings with lightning fast file transfer has resulted in over a billion downloads on supported devices. 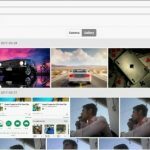 This article will introduce you to the SHAREit app. We have also provided the link to download the official app for your device. 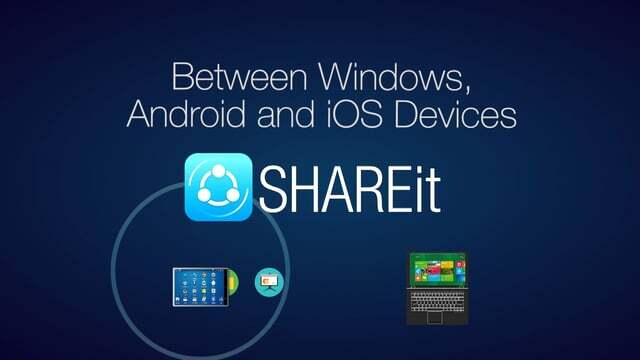 We will also shed light on how to use SHAREit for PC. SHAREit is a file sharing app developed by Lenovo. It can complete file transfers between devices in minutes — irrespective of the file size. The speed of the program is such that it allows you to share a full movie within a matter of a few seconds! It doesn’t make use of cellular data, nor Bluetooth connectivity. Instead, it relies on high-speed Wi-Fi connectivity to transfer files between devices. To give you a comparative picture, sharing files with SHAREit is 200 times faster than the speed of Bluetooth. It is a truly cross-platform compatible application with support for Windows, iOS, Android, and Mac OS X operating systems. You need a Wi-Fi enabled device to take advantage of this amazing file transfer utility. At present, SHAREit is being used by a whopping 1.5 billion global users from over 200 countries. There are several reasons behind such an insane demand. Lightning Fast Speed: As already mentioned, file transfers using SHAREit are lightning fast. The days of relying on data cables and Bluetooth for sharing files are over. SHAREit makes use of high-speed Wi-Fi connectivity to transfer huge files at a speed of nearly 20 mb/s. No Cellular Network Required: Since SHAREit utilizes Wi-Fi connectivity, there is no question of consuming your mobile data. It works even in the complete absence of a cellular network. No Third-Party Involvement: SHAREit doesn’t use any cloud service for storing the data being transferred. It originates from one device and gets stored on another, without any third-party involvement. In other words, your data always remains in your safe custody. Multiple User Support: SHAREit supports file sharing for groups of up to 5 users simultaneously. You can instantly send a photo album, music library, or video playlist to 5 devices at the same time within seconds. Cross-Device Support: No matter if you are using a Windows PC, Apple MacBook, Android smartphone, Apple iPhone, or Windows mobile, you can use SHAREit without any issues. Cross-platform compatibility is a hallmark of this amazing app. 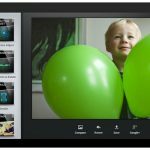 How Do I Download SHAREit for PC? 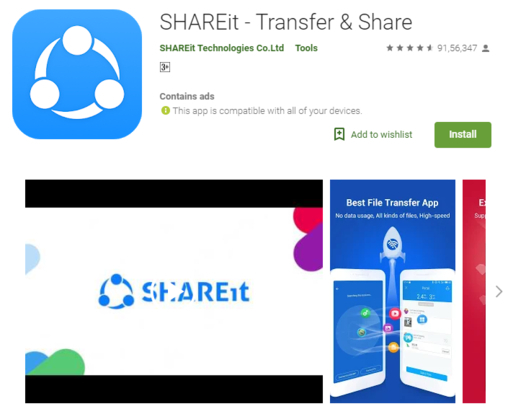 Android users can download the official SHAREit app from Google Play Store. It is always featured under the “Top Downloads” section, making it easy to locate the utility. If you are using an Apple iPhone or MacBook computer, you can find the official app in the iTunes repository. An official version of SHAREit is also available for Windows 10 PC and Windows 8 mobile users. You’ll need to visit the Microsoft Store to download the app on your Windows device. Are There Any System Requirements to Use SHAREit for PC? The only prerequisite to use SHAREit for PC is Wi-Fi connectivity. If your desktop/laptop computer is Wi-Fi enabled, you can download and install this app without any issues. The other point to keep in mind is version compatibility. SHAREit for PC supports only Windows 10 operating system version 10586.0 or higher. Similarly, MacBook users must be using OS X 10.10 or later with a 64-bit processor architecture to install the app. What If My PC Doesn’t Have a Supported OS? If you are using Windows 7/8 or a non-supported version of Windows 10, then SHAREit won’t run correctly on your PC. The same holds true for MacBook users with OS X 10.9 or below. Don’t worry, you can still use SHAREit for PC on a non-supported version of Windows / Mac OS X. All that is required from your end is an Android emulator program. An Android emulator can be used to run Android apps on non-supported operating systems. It resides within a host operating system as a virtual device to run Android-specific apps. Follow the steps given below to download SHAREit on computers powered by a non-supported operating system (such as Windows 7/8). Go to https://www.bluestacks.com/download.html to download the BlueStacks Android emulator. Go to your “Downloads” folder. Double-click to run the executable file. Follow the on-screen instructions to complete the BlueStacks installation. Reboot your computer. Launch BlueStacks and log in using your Google credentials. Navigate to Dashboard >> All Apps >> Browser. Type “https://play.google.com” in the browser address bar and press the Enter It will take you to Google Play Store. Search for the SHAREit app and install it on BlueStacks as you would normally do on an Android smartphone. That’s all that is required from your end. With this, you have successfully installed SHAREit on your non-supported Windows / MacBook computer. You can now launch SHAREit from within the BlueStacks console to transfer files between devices. 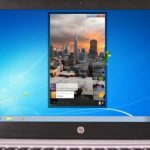 This article has guided you through the process of installing SHAREit on your desktop/laptop computer. We have also included links to the official download pages for Android, iOS, Mac OS X, and Windows PC users. Even if your PC doesn’t come with a supported operating system, don’t panic. We have provided you the necessary tweaks to install SHAREit for PC on non-supported platforms. We hope the guide helps you to successfully install SHAREit on your computer. If the article was helpful to you, then don’t forget to share it among your friends and followers. How to Download and Install Periscope for PC?